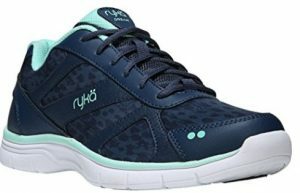 Today we review five cross training shoe sneakers from manufacturer Ryka. 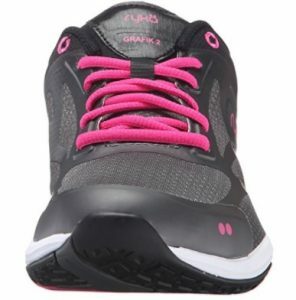 Ryka produce shoes solely for women and specialize in exercise and athletics. For twenty-five years they have been making training shoes exclusively devised with the female foot in mind. 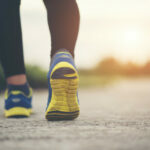 This means they are a little roomier in the forefoot, wider in the toe and narrower in the heels, than the standard men’s trainers. 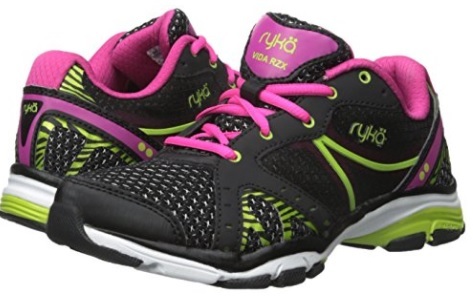 Out of all the Ryka shoes in this review, the Vida RZX are the most colorful. Although of the three variations available, there is only one we can currently find available for sale at present. 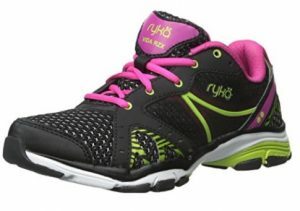 This is the Black/ Ryka Pink/ Blaze combination, which is a mainly black shoe featuring colorful pink and lime green overlays. 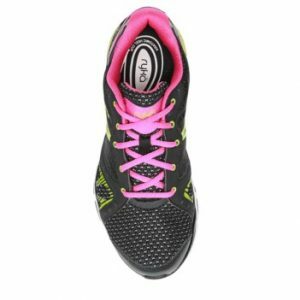 This may not be the lightest of our five shoes, but it certainly feels lightweight enough and comes with the prized pivot, which makes it one of the top choices for dance instructors everywhere. For a dance shoe that can do more than just pretty twirls, we say these make a great choice and offer a good fit and support to boot. 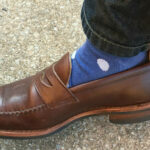 If style is the deciding factor and you want something with added zing, this should be your shoe of choice. 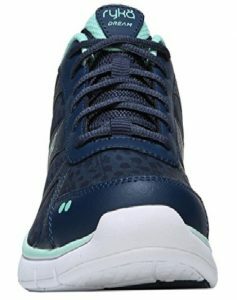 Unlike other in this review, this is not a mesh construction but a printed stretch material with both synthetic and leather overlays. 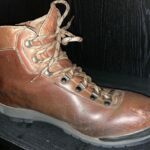 This is the only shoe in this selection which features leather. At 8 ounces shipping weight, this is one of the lighter pairs and also one of the cheaper. This does not make it any lesser than the others. These are a beautifully sleek design in subdued shades which are not in the least bit girly, but still have plenty of style. Complete with pivot points and two width fittings, these fit well and should be good for a variety of activities – as long as it doesn’t involve getting them wet! 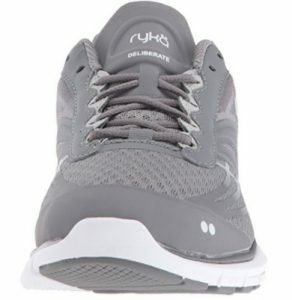 The lightest of all our review pairs, the Ryka Women’s Deliberate Cross Trainer Running Shoe Sneaker is decidedly a no fuss shoe. By this we mean they look the business, are a good fit and look smart. But they aren’t girly in the slightest. 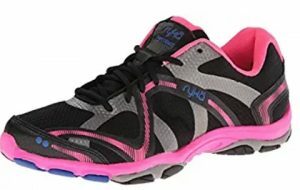 The lack of pivot points means that although you can wear these for Zumba, the other pairs may be a better choice if you are exclusively purchasing them for this. 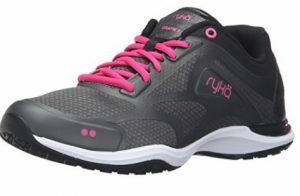 We think these make a great training shoe for gym, boxing or maybe even running. 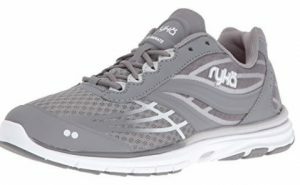 In fact, they are an excellent all round exercise shoe. And with an overwhelming endorsement from customers, you should be fine to order your regular size. Perhaps not the lightest of our selection – but all of them are very lightweight anyway. These however certainly look the lightest, even if they are not in real terms. An incredibly sleek design and some sophisticated color schemes gives these the edge for a sophisticated look. 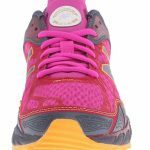 These fit well and have a slightly higher heel and also feature pivot points, for spinning on – although if you have a wider foot, you might want to go up by half a size. More striking than some of the other styles. 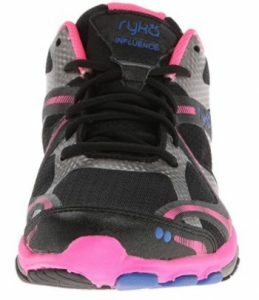 The Ryka Influence Cross Training Shoe Sneaker has an impressive two tone swirl effect (which is really a three tone) and features some bright flourishes. 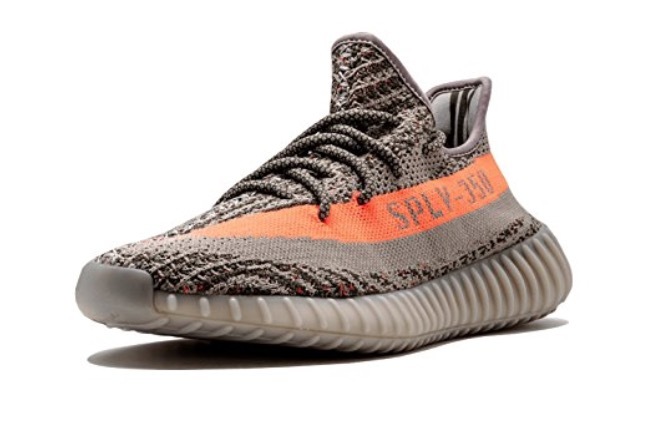 Once again, you might want to size up for wider feet and these have the much coveted pivot points, for dancing and swirling with. If you are looking for style and a comfy, cozy fit with bags of extra support – these may be the style for you!